The purpose of this vessel is not clear. It may have been used as a waterpot or a candle-holder, or some other container. As a waterpot, a small metal spoon would be placed in the vessel for scooping out small amounts of water to mix with ground ink on a palette. 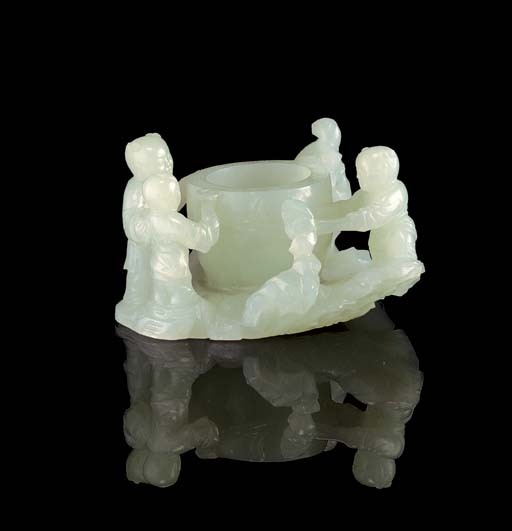 This vessel, surrounded by small figures of boys, is closely related to the bowls and cups with similar composition of boys clinging to the rims of the vessel, usually forming the handles; see Jadeware (III), The Complete Collection of Treasures of the Palace Museum, Hong Kong, 1995, pls. 163, 164, 202 and 204.